The speed of light is known as the universal speed limit. 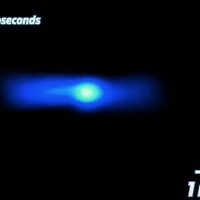 Nothing can ever go faster than that, but apparently it’s possible to actually film light moving at that speed. The Slow Mo Guys went to CalTech and took a look at their massive rig where they were able to see what it looks like when a beam of light moves through a bottle of water and other stuff. Being honest, it’s a little underwhelming. I suppose it’s not supposed to look cool. It’s just light. The concept of “filming the speed of light” is way cooler than the actual video you wind up with.